With GM Phil Emery finally cut loose and the short, but not-quite-short-enough, Trestman era coming to a crashing end, the last major item on the Chicago Bears’ to do list is to find some NFL patsy willing to take Jay Cutler off their hands. But as Jay slowly fades into the turnover sunset, I want to remind folks that, back in 2009, the Chicago Tribune, Sun-Times, and Daily Herald sportswriters were virtually unanimous in clamoring for the Bears front office to go after the mentally weak Broncos’ quarterback at all costs. Why, that gaggle went as far as accusing the Bears of not really wanting to win if they dared to pass up this possibility. The irony, of course, is, those very sportswriters are the same ones currently calling for Cutler’s head. And they’re doing their damndest to make it sound like they were onto him all along because they clearly believe the rest of us have very short memories. But I haven’t forgotten about all those old columns. Once! Just once, I would love to see a Chicago sportswriter simply admit they were wrong about something. Though I’m sure that will never happen because, when you consider their dismal track records, the mea culpas could go on for days. C’mon! The Tribune sports team was a dismal 10 and 39 in predicting the outcome of Bears games seven weeks into the season. And we’re talking about simple wins and losses here – they didn’t have to deal with the spread! Even Marc Trestman’s record was better than that! The sad thing is, Cutler’s mental collapse should come as no surprise to anyone with half a brain which explains why Chicago sportswriters completely missed it. If the mere mention of a trade – to the Patriots, no less – was enough to send a supposed frontline quarterback flying into a furious demand-to-be-traded temper tantrum frenzy, then can the fact that he can’t figure out which team he’s supposed to throw to come as any shock? The guy is passive aggressiveness personified. If just one teammate/coach/GM/owner fails to consistently extoll his endless virtue, Cutler gets back at ’em by playing like abject crap. He’s the NFL equivalent of a Jewish mother-in-law. Rodgers, Brady and Peyton Manning have all had their ups and downs, but as real leaders always do, they take responsibility for the downs and give their teammates credit for the ups. 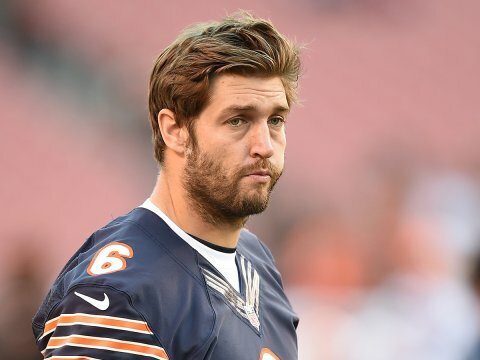 Jay Cutler has never understood that dynamic and, thus, he will never be more than a mediocre quarterback. And he soon will be gone. All I can say is good riddance! And maybe, just maybe, someday, Chicago sportswriters will actually get something right! Praise God that Trestman & Emery are gone as of today. I look forward to forgetting all of the gruesome details held within this season and moving on. Cutler is not the Bear’s worst quarterback ever, but Emery’s 7 year contract extension to Cutler on top of the original 2 1st round & 1 3rd round picks & Kyle Orton was a horrific disaster. I think Brian Xanders would make a great GM for the Bears, he knows talent needs temperament. It’s only a stupid game. If you don’t own stock in the Bears, why care? If you own season tickets to this loser team, raise Hell with the Bears’ owners, because it its they who sign the checks! The best way to cure management’s attitude is to stay home on game day. Don’t buy tickets. Don’t buy their overpriced beer and concessions. Don’t buy their “licensed” caps, shirts, sweats, jackets, or anything else they peddle. Like the other loser Chicago team, the Cubs, hits to their wallet will do more good than just squawking about it here, or anywhere else. The sports media members never ever get fired for being wrong, wrong, wrong. And they never report just how wrong they were. Take a look at some of these preseason predictions for the Bears 2014 record: Hub Arkush, Rick Morrissey, Mark Potash, Patrick Finley, Michael C. Wright, Carmen DeFalco, John Jurkovic, Marc Silverman, and Tom Waddle all predicted the Bears would be 10-6. Adam Jahns and Fred Huebner said the Bears would be 11-5. Rick Telander, Jeff Dickerson, Jon Greenberg, Melissa Isaacson, and Michael Wilbon all predicted 9-7. Jonathan Hood and Matt Abbatacola predicted 8-8. Las Vegas set the over/under of Bears victories at 8 1/2. Advanced Football Analytics predicted 9-7. The ESPN Power Panel, consisting of 80 experts, said the Bears would win a wild card playoff berth. Oops. You are absolutely correct and God bless you for keeping track. Perhaps I was the only one predicting they’d go 6 and 10!